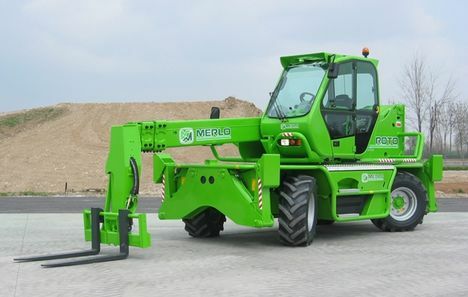 Telehandlers are renowned for their versatility and superior lifting capacity across a vast range of industries. The reasons for their popularity range from their sturdiness to the fact that they can be used with dozens of different attachments. In fact, since they first appeared some 30 years ago, telehandlers have become part of the furniture in warehouses, construction sites and on farms across the UK. However, over the past decade or so there has been a new kid on the block. Whilst at first they didn’t take hold these machines have been becoming gradually more popular due to their increased versatility and enviable manoeuvrability. With their 360-degree range of operation and massive lifting capabilities, Roto Telehandlers are becoming a must-have in many industries. Companies are opting to purchase or hire Roto Telehandlers in ever increasing numbers. This article takes a look at why. Now, whilst the modest telehandler cannot be written off, there are some jobs that are simply best left to the Rotos. Here we’ll examine four situations that match this description. Whilst telehandlers are great for tackling tough terrains, there may come a time where yours will simply not be able to extend far enough to reach to its desired target. This might occur on construction sites, in agriculture or in other tricky environments such as woodland or forests. Fortunately, Roto telehandlers were built with tricky terrain in mind and are often far superior to standard telehandlers at tackling it. Superior suspensions along with chassis and wheels designed specifically for rough terrain are just the start of the Roto telehandlers dominance on tough terrains. Once in position, their extreme manoeuvrability allows you, the operator, to extend and rotate the boom through the air to bridge any otherwise inaccessible gaps. Again, the manoeuvrability of a typical telehandler is not something to be sniffed at despite it being surpassed by the Roto. Tight squeezes are easily tackled with the 360-degree rotation, which allows operators to reach targets at otherwise awkward to access targets. Moreover, the telehandler’s continuous rotation means goods or people can be transferred to and from multiple locations without the need to manoeuvre the actual machine. Again, this makes them ideal for tight squeezes or otherwise difficult to reach locations on construction sites, in warehouses and in yards. Many Roto telehandlers are in-fact what you’d describe as mini-cranes. They have excellent lifting capabilities in both height and load, with top of the range machines capable of moving in excess of 6,000kg up to heights of 20m. Naturally, this is highly desirable for a number of industries, not least construction and heavy-manufacturing. What makes Roto telehandlers superior to standards telehandlers is this huge lifting capability whilst the boom is extended. Whilst extending the boom reduces the maximum capacity, the effect is typically much less than on a standard telehandler, where extending the boom can dramatically decrease the max rated load. Before operating any telehandler it’s important to check the load charts and arcs to ensure rated loads are not exceeded. Roto-telehandlers are becoming increasingly popular for lifting personnel up to difficult to reach work areas commonly found on construction sites and farms. The increased manoeuvrability and extended reach means that areas inaccessible to a typical telehandler can be accessed at ease by a Roto. With a lifting platform attached, this allows staff to work safely at heights without the need for specialist lifting equipment or cherry pickers. It is worth noting that, when using a Roto telehandler with a personnel platform there are certain safety measures that should be adhered to. Always examine the load charts to minimise the chance of the telehandler tipping (although this is already reduced in a Roto in comparison to a usual telehandler) and ensure the correct harnesses and PPE is worn by the member of staff upon the platform. So there you have it; four jobs suited perfectly to a Roto telehandler. Whilst they may never replace the telehandler as the number one lifting machine of choice, it is little wonder they are becoming increasingly popular across the UK in all manner of industries.